In some circles, you aren't allowed to mention paid advertising and inbound marketing in the same sentence. However, with social media and the new HubSpot Ads add-on, more marketers are warming up to the idea of the two working together. As an inbound agency, we're most concerned with how you can make the biggest impact with inbound marketing and we've found that paid advertising can actually help you do so. Now, before you go sign up for Google Adwords and drain thousands of dollars into a half-brained PPC campaign, there are some things you should consider. For paid advertising and inbound marketing to work in harmony, you have to be tactful with your approach. 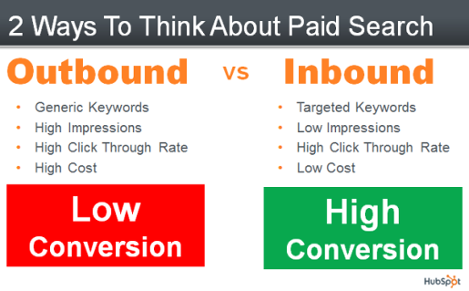 With this in mind, I'm going to share five things that you need to know about paid advertising and inbound marketing. Inbound marketing is a long-term investment. When you publish content on your blog, that content is available forever. On the other hand, paid advertising is a short-term investment in the sense that once your ad budget is spent -- those ads are gone forever. That's why it's so easy to see a terrible ROI from paid advertising, but history has shown, even sub-par inbound marketing eventually reaches a positive ROI. Determining how well the two methodologies can work together comes down to your paid advertising approach and your budget. Your company only has so much money it can spend on marketing, so you want to make sure that each dollar is well-spent. The outbound approach has lower conversions, so you have to spend more to get the same return, however, targeting generic keywords gets more impressions and more traffic meaning, more eyeballs on your brand. That can't be a bad thing, right? Your marketing has to have a positive ROI or you're wasting your money, and seeing a positive ROI from an outbound approach with paid advertising is more difficult. Instead, you could spend the same amount of money with an inbound approach and, although you'd be reaching fewer people, you'd get a higher return on your investment. This also fits better with everything else in your inbound marketing campaign because the keywords are highly targeted allowing you to create content specifically for your ideal buyer persona. Once you have your foundation of inbound advertising setup and you're seeing positive returns, then you could use some of that excess budget to get more brand awareness through outbound paid search. Just make sure that you aren't spending enough to cause a negative ROI overall. A/B testing can dramatically improve the effectiveness of your landing pages -- the problem is that you need a decent amount of traffic to optimize your page. If you're getting 10 to 20 visitors trickling in each day, that's really not enough data to make smart decisions. A/B testing relies on identifying trends in behavior and while people in large groups can be very predictable, as individuals they are not. That's why you don't want to overreact to the behavior of a small amount of traffic. You only have to spend a little money upfront to send traffic to your landing page. Once you've optimized it to a conversion rate you're happy with, you can cut off the ad-spend and let that page work its magic. What's nice about taking this approach is that you have one less thing to worry about. With the inbound methodology, you've got several cogs working at once in your marketing funnel and any one of those individual cogs can slow the entire machine down. The beauty of a high-converting landing page is that you can set it and forget it. That doesn't mean you shouldn't have A/B tests running constantly, but once you reach a point where you're making increases in conversions by single-digit percentages, instead triple-digits, it becomes a lower priority. Once you've published enough content to start gaining traction in the search engines, you'll start to gather a lot more useful data in your analytics. Among the valuable insights you gain are the keywords that people search before they land on your website. These keywords are very important because they give you ideas for content to create and they let you know exactly what your persona is looking for -- which you can use to boost your paid search effectiveness. Keyword research is great for identifying trends, figuring out what people are looking for, and understanding which keywords are most competitive. It's absolutely essential that you do keyword research before creating a PPC (pay per click) campaign or you will waste a lot of money. Your organic search traffic, however, gives you an advantage in your keyword research because it shows you which keywords are already bringing leads to your business. With that information, you can create PPC campaigns that target those keywords and amplify your results. On the other hand, paid search can also benefit your content marketing. In your PPC campaign, you will likely be targeting hundreds of keywords and phrases. Looking at the analytics from your PPC campaign will reveal which keywords have the highest demand. By targeting those same keywords in your content marketing, you can start getting more of that traffic organically and you are more likely to keep paid traffic on your site because you will have the specific content they're looking for. Over time, you will rank higher for the most valuable keywords in your niche and you can eliminate paid search completely if you so choose. What happens when your prospect is ready to buy, but they can't find you? They end up taking their business to your competitor. A key strategy with inbound marketing is building a relationship with your buyer persona before they're ready to buy, so when the time comes that they are ready, they don't even have to think twice about who to buy from. On the other hand, there are plenty of cases where a person is ready to buy now, but they don't have a brand in mind. Depending on what type of product or service you offer, this might not be very common. For example, if you sell a high-priced service or a very complex product -- the purchase cycle typically takes longer. For all of the other companies, though, there are lots of impulsive shoppers that are ready to whip out their credit card and make a purchase in minutes. Paid advertising lets you target those specific people so that your brand is easily found, right when your persona wants to find you. Paid advertising also allows you to target audiences that are highly relevant. For example, with Facebook advertising, you could target people who already like the fan pages of your competitors or popular blogs in your niche. That way you know that the only people that are seeing your ads are people that have already expressed an interest in what you offer. The result is your brand being in the right place at the right time. The purpose of this article is not to convince you that paid advertising is better than inbound marketing or that it's even necessary at all. The point is to show you how paid advertising can be used to enhance inbound marketing and help you get results quicker. Realistically, it usually takes at least six months to start seeing noticeable results from inbound marketing. One of the main reasons for this is that inbound marketing focuses on gaining organic traffic and search engines take a month or two to adjust to the actions you take today. Another reason is that getting traffic through social media organically requires time for building relationships and for your current fans to start spreading the message. Paid advertising allows you to cut in line and get your content in front of your persona sooner, which gets them into your marketing funnel sooner. 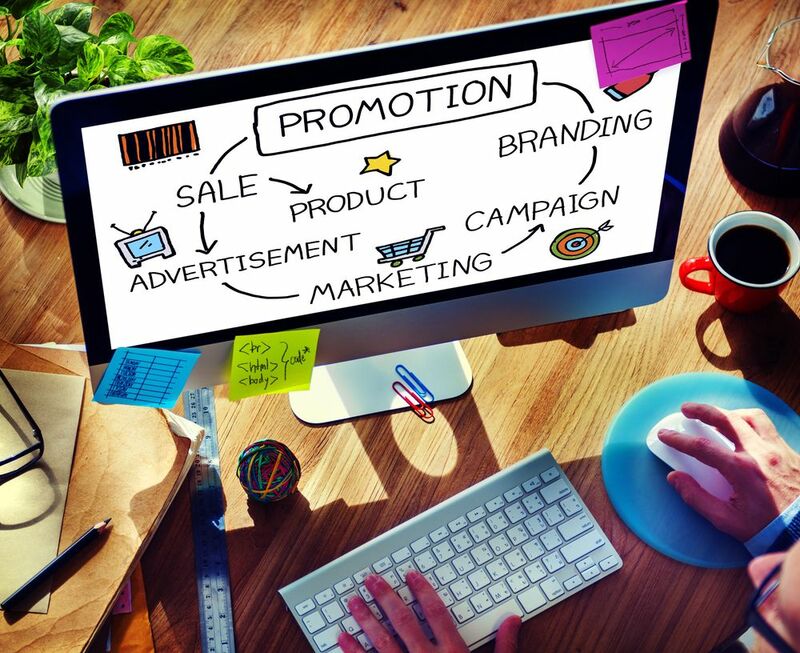 Paid advertising won't be effective if your inbound marketing isn't already good. You're simply buying more opportunities to deliver your message, but your message has to resonate or you're just paying for more people to turn you down. Too many marketers try to pump money into advertising because they are too lazy to do inbound marketing the right way. Instead, we recommend you invest more time and money into your inbound marketing strategy, so it only takes a small amount of ad-spend to get a big boost.